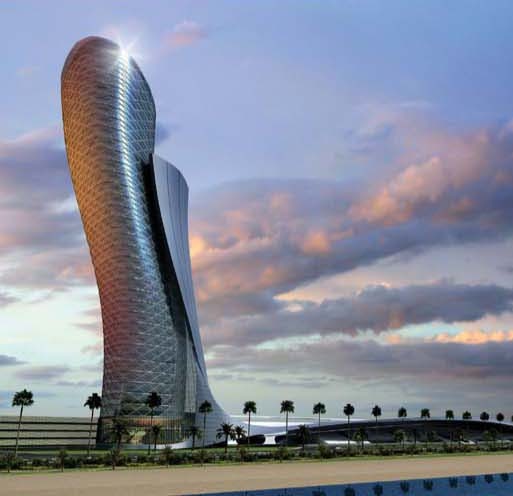 Capital Gate set to enter Guinness Book of Records as ‘world’s most inclined tower’: Iconic tower will lean 4 times as far as Leaning Tower of Pisa. Capital Gate leans westward an astonishing 18 degrees; by comparison the Leaning Tower of Pisa leans less than 4 degrees. Because of its unique posture, the tower is being constructed on top of an incredibly dense mesh of reinforced steel. The dense mesh sits above an intensive distribution of 490 piles which have been drilled 30 metres underground to accommodate the gravitational, wind and seismic pressures caused by the lean of the building.